I made my version of Pulkogi, which is one of the most popular Korean dishes, tonight. Instead of cooking it on the grill or the in the iron pot, I made it with the donabe (clay pot). My "donabe pulkogi" is cooked with a lot of vegetables, so this one dish (with the side of rice, cooked with donabe rice cooker) creats the wonderfully balanced meal. All you need to do is just assemble the ingredients in the donabe. Mix the ingredients for the marinade and marinade the pork for 15-30 mintues. 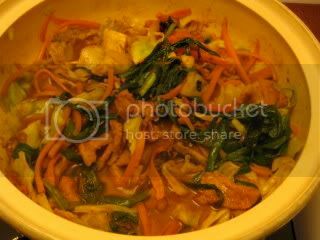 In donabe (clay pot), put the marinated pork in the center of the bottom. Place the cabbage, carrot, nira, and shiitake, so that they can surround the meat. Pour the chicken stock (this will prevent the bottom of the donabe from burning. Close the lid of the donabe and cook at medium-heat for about 10 minutes or until the ingredients are almost cooked through. Open the lid and mix the ingredients with the chopsticks until everything is cooked. Serve pulkogi with the rice.